Update: Display Recorder has been pulled from the App Store. Below is the original app review. Do you tire of explaining how to navigate your iPhone, iPod Touch, and iPad? 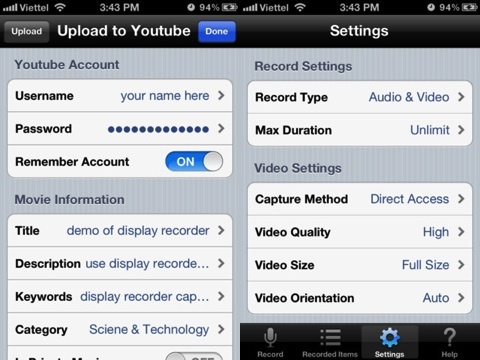 The Display Recorder iOS app lets you record and share a video of your screen. Previously only available as a jailbreak app, it is now available for $1.99 in the iTunes App Store. 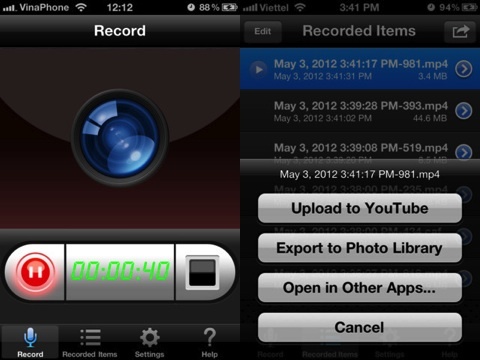 The Display Recorder app has a streamlined, no frills interface for a quick and easy user experience. The home screen has a graphic of a camera lens, a start button, and a timer. You simply press the start button, then you press your home button and navigate through your iOS device’s screens. You can open and close iOS apps, scroll through mail, and even watch videos. A video’s audio does interrupt and impact the ability of the Display Recorder iOS app to properly record audio. As you navigate, a red bar remains at the top of your screen to let you know it is recording. This feature can be eliminated, if you make an appropriate adjustment in the settings menu. When you use the Display Recorder iOS app, you may encounter a bit of lag in your iPhone, iPod Touch, and iPad’s speed. An additional navigation menu bar rests at the bottom of the Display Recorder iOS app home screen. With one touch you move between the home screen, your recorded items, settings, and the help menu. The recorded items screen is a simple list format. You touch the video, and you can update title, description, keywords, category, and privacy parameters. You can also upload to YouTube, export to photo library, and share with Dropbox with a touch. The sharing functionality was wonky, and the performance was not necessarily consistent. Sometimes videos uploaded quickly and easily, but on other occasions, the upload was not successful. The settings are thorough and easily adjusted. The help menu and directions are succinct and helpful. The Display Recorder iOS app will benefit from some tweaking to make the sharing capabilities as seamless as the recording functionality. This deficiency certainly impacts the rating, but it is an extremely useful iOS app with hope and promise. AppSafari review of Display Recorder was written by Jenni Ward on June 26th, 2012 and categorized under App Store, iPad apps, Productivity, Universal, Utilities, Video. Page viewed 6918 times, 1 so far today. Need help on using these apps? Please read the Help Page. And it’s been pulled. Glad I grabbed it when I did!